App Store Best of 2013! Sago Mini Doodlecast is a unique drawing app that records your voice as you draw. Capture every stroke, word and giggle. Perfect for children ages 2-6. Play back your drawings and share them with friends and family. Sago Mini Doodlecast comes with more than 30 drawing prompts – simple questions designed to inspire your child’s imagination. Choose a prompt or start from scratch. The app records the entire drawing process along with audio from the microphone to create short videos. The videos are as fun to watch as they are to create. 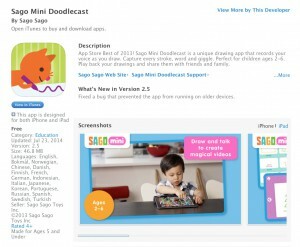 Sago Mini Doodlecast is a fun creative activity and a valuable teaching aid. It’s a great way for kids to express themselves through art and conversation. Families can use the app for everything from practicing counting and letters to talking about experiences and feelings. • Supports more than 14 languages including Spanish, French, German, Russian, Japanese and Mandarin. • No in-app purchases or third-party advertising, so you and your child can play without interruptions! Our team of designers and developers create apps that children love and parents trust. We build on kids' natural sense of wonder, creativity and curiosity to make apps that are safe, positive and fun. Sago Mini are the ideal first apps for your little one.